The legal job market has recently been under scrutiny for multiple reasons – limited opportunity for advancement, excessive starting salaries, and the threat of automation replacing traditional positions. With each of these claims, the impact on new lawyers seeking their first career opportunity is often trivialized. Last year, there were nearly 35 thousand new juris doctorates (J.D.) received in the United States and with each graduating class, the competition for employment only increases. 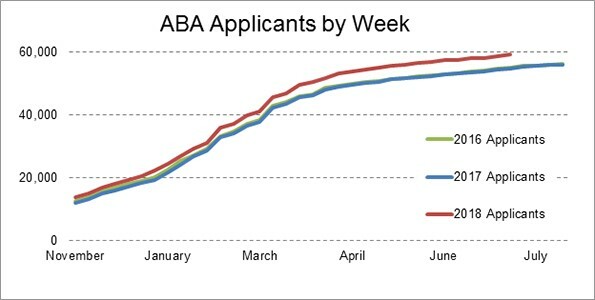 Even though the job market for lawyers has yet to improve, law school applications are still on the rise, with the LSAC reporting a 9 percent increase between 2017 and 2018. Source: Law School Admission Council, Inc.
What is often left out of the conversation are the intricate developments within the industry that may impact a new lawyers’ career decision post-induction -- the progressively fast-paced timeline for projects, the integration of technology for increased efficiencies, the implementation of legal process outsourcing (LPO), and the rise in salary range. While there has always been an unspoken protocol requiring associates to devote the majority of their time to building a strong reputation, the need for 24-7 availability is the new expectation. In the “microwave age” of clients and employers wanting rapid responsiveness and results, new associates should now expect to be available beyond standard working hours for pressing matters. Emerging lawyers tend to understand that they are entering a profession in which they will be always be on-call, prior to starting law school. In the winter of 2018-2019, Stanford Law School will even be introducing a course to second year students entitled “Professional Development & Management Skills for Lawyers” that focuses on managing expectations in a legal career and “communicating with clients, colleagues, other parties and tribunals” in preparation for what’s to come following graduation. Learning to handle client and counsel expectations while continuing to have a life outside of work can be a heavy lift, but also rewarding when accomplished. Having the necessary tools to be an active and reliable member of any practice is key to keeping up with this fast-paced industry. Artificial intelligence (AI), in relation to job security, continues to be a hot topic in all sectors of the current job market. With the persistent influx in technological advancements that aid human efficiency and productivity, new lawyers should anticipate the practice of working alongside information technology (IT) specialists and utilizing legal automation tools in every business setting. In our previous blog post entitled “Bridging the Gap Between Legal and IT,” we discuss the importance of integrating and cross-training legal professionals with IT personnel in an effort to advance a firm’s overall efficacy. New lawyers should not only aim to be technically-savvy, but become masters of facilitating the collection, storage, and transference of data between themselves and the client. The emerging legal delivery model demands the collaboration of humans and technology to drive business initiatives and, in effect, win cases. The introduction of AI will not deplete job opportunities for new lawyers, but conversely allow for additional efficiencies in legal processing. Long gone are the days of passing the bar, being sworn in, securing an associate position at a top choice firm, and immediately beginning to practice as an appointed attorney. With the recent uptick in firms utilizing legal process outsourcing (LPO) to complete the more commonplace tasks of document review, PFS preparation, and traditional paralegal responsibilities, there becomes a new demand to staff these unique positions that do not necessarily require a law degree. Ten months after graduation, only about 63 percent of graduates find legal positions where bar passage is required, and most are short-term contracted positions, according to the American Bar Association. In 2016, lawyers occupied about 0.63 percent of all United States full-time employees, with nearly half of them landing in the legal services sector. The understanding that legal services firms are nabbing top talent should not discredit the hard work recently completed by a new graduate. Rather, this transformation in the standard legal career pipeline should prove to be a catalyst in the adoption of managerial roles in a non-traditional firm setting. Through the seemingly dark tunnel of long hours, diversified knowledge capacities, and managing LPO vendors is the anticipation of increased compensation. The good news being, 2018 is a groundbreaking year for starting associate salaries. This is a big win for new lawyers, giving the prime opportunity to maximize earnings fresh out of law school. Whether completing a second year of grad school, or as a tenured associate for a firm listed in the Am Law 200 ranking, taking heed to these changes in the legal job market will benefit the longevity of any legal career.